Indian officials here clarified that the deal with Tokyo confined to Mumbai-Ahmedabad sector and India is open for Chinese investments in other corridors. In addition to conducting feasibility study to build the high-speed railway track to the nearly 2,200 km-long Chennai-Delhi, an India-China consortium is also conducting a feasibility study for the 1,200 km-long New Delhi-Mumbai corridor. Indian officials here told PTI that Japan has undertaken the feasibility study for the Mumbai-Ahmedabad corridor well before China entered the fray, offering to do the Chennai-Delhi corridor which was expected to cost over $20 billion. India’s decision to opt for high-speed trains in other corridors will depend on easy and affordable financing terms as offered by Tokyo for the first high-speed train in India, they said. Tokyo-Osaka line was profitable from the start. It transports 150 million passengers every year, that is 400,000 every day. Mumbai and Ahmedabad have similar populations (actually Ahmedabad has much more than Osaka). Its some of the other lines that were built to less populated areas in Japan that put Japanese Railways in debt. This thread IMHO is going from actual data to beliefs to opinions and is now just an opinion slugfest. How many actually traveled as a commuter in the Mumbai-Ahmedabad Sector? Not once or twice on Rajdhani. But over a period of time (minimum 6 months)? If you have not traveled that many a times., then please pause before you post. I had a chance to be a regular commuter on the Mumbai-Ahmedabad/Mumbai-Baroda-Ratlam line (and very recently I did that trip again). I used to reel off the time table of the trains. People who have not been on the Mumbai-Surat-Vadodra-Ratlam and Mumbai-Surat-Vadodra-Ahmedabad or Mumbai-Ahmedabad-Delhi sector do not or cannot envisage the amount of travel that is done on this sector. It is estimated that 4 lakh people travel daily (air, train, bus, car, taxi, cycle, rickshaw ...) and given the growth of this region, it is projected to handle 10 lakh travellers daily by 2025. Imagine that for a moment., that a million people will be travelling daily - mumbai-ahmedabad. And no I am not kidding., whatever transport is thrown at this sector., it is woefully inadequate. Note that we are not even talking about ahmedabad-delhi corridor yet. If mumbai-ahmedabad-delhi is taken into account., it is huge (already there are 16 flights from Jet alone on this sector!!!). *The above number in my personal opinion is conservative. The amount of blood, sweat and tears I have spent and seen on this corridor to me - it is already approaching 1 Million and will grow to 1.5 M by 2025. To know the popularity of the Tokaido line vis a vis airlines, there are only four flights daily from Tokyo to Osaka as searched on expedia, where as makemytrip showed up 20 flights from Mumbai to Ahdbad daily. All that flight traffic will be shifting to HSR. The huge debt of JNR by 1987 does not seem to be the result of Shinkansen only. Freight and passenger traffic moving away from railways to air and road also contributed to the losses. There are WAY more than 4 flights per day between Tokyo and Osaka. In fact that has been one of the world's top 10 busiest air routes for a long time. I have both flown and ridden the Shinkansen on that route. Both run packed. Most of the Tokyo-Osaka flights are between Haneda and Itami airports, not between Narita and Kansai, both of which are far from the city. Given the choice, I would take Shinkansen. Far more comfortable and spacious than an aircraft, and takes just 2h30min to cover the 515km route. I've only traveled the Tokaido line, and it's an extremely smooth ride, more so than Spanish or French HSR. No jolts or movement inside while the scenery outside is whizzing past at 270km/h. Yes, JNR's bankruptcy was because of several factors, not just Shinkansen. They had to run 'social services' trains to remote areas at a loss, and also pay down the accumulated construction costs for the Shinkansen. The most stressful period is usually the first 10-15 years after construction. The Japanese Mumbai-Ahmedabad proposal bakes in a 15 year construction period before the SPV starts paying the soft loan back. It's terms don't seem any different from the JICA loans going to Delhi Metro etc. It's simply a much larger and more high profile project that the Japanese find extremely prestigious, due to the competition they face from the Europeans and Chinese. hanumadu wrote: To know the popularity of the Tokaido line vis a vis airlines, there are only four flights daily from Tokyo to Osaka as searched on expedia, where as makemytrip showed up 20 flights from Mumbai to Ahdbad daily. All that flight traffic will be shifting to HSR. Average price for that is Rs. 3600. Note that this sector is already under capacity., so there may be some decrease in number of flights - but not much (I am estimating just 10% impact to flights by 2025). Adding to Suraj-san's post above., think of Mumbai as a conglomeration of cities. I do not think bullet train terminal will be co-located with the Mumbai domestic airport. There is the navi-mumbai and other areas which will not have access to the bullet train terminal and hence air travel will be a better option. You don't need the bullet train service co-located with an airport, and it doesn't necessarily make sense. Tokyo's Shinkansen stations (Tokyo Station and Shinagawa) are not at the airport. Narita airport was supposed to have a Shinkansen station but it was canceled long ago as economically unviable. Osaka's Shinkansen station isn't even the main city stations but the Shin-Osaka station located outside town. It was built like that because they couldn't get land and build the alignment right into town even back then. But Shin-Osaka is well connected to the city. Proper connectivity is through different modes of transport is better to have. Suraj'san - Vehemently Agree to your point. My point was to Hanumadu-Sir's point that bullet train will cannibalize air traffic. It will not (added later: It will not completely cannibalize air traffic. My estimate from the seat of pants is 20%). But I do agree with Hanumadu'jis point that the people who travel by bullet train will be in the same 'class' as the air traveler., so they will not mind paying extra for the time gained. 1. Net cost to service the loan (Principal + Interest) = Rs. 2000 crore/year. So with 50k ridership paying current prices of 75% of the air travel cost., we are able to pay off yearly the loan (principal + interest). *Indian railways in this quarter achieved 98% operating cost. So operating costs at 95% is doable. Last edited by disha on 15 Dec 2015 06:33, edited 4 times in total. disha wrote: Suraj'san - Vehemently Agree to your point. My point was to Hanumadu-Sir's point that bullet train will cannibalize air traffic. It will not. With lower ticket prices, by 2008, KTX has swallowed up around half of the airlines' previous demand between Seoul and Busan (falling from 5.3 million passengers in 2003 to 2.4 million). Generally when HSR comes into service, it takes away marketshare in relative and absolute terms. In Japan the Shinkansen is so heavily booked on the Tokaido main line that I'm guessing a lot of airline travelers are those who simply could not get a convenient train ticket for their travel dates and times, or got deals on low cost carriers. When traveling Shinkansen around New Years there, we had to have a friend buy us our tickets locally a month ahead because chances of getting a reservation after we landed were slim. Glad to see someone delve into numbers rather than just post emotionally charged political noise here. All that flight traffic will be shifting to HSR. So yes., I agree on the point of cannibalization of air traffic by HSR. But I disagree on the degree of cannibalization. Suraj wrote: The first stretch of the DFCC is coming into operation *this* financial year. Railway and road projects aren't put into service km by km. They build the whole thing, electrify the whole thing, and then it goes into service. Saying 'nothing has come into service yet' is like jumping off a tall building and repeatedly saying nothing has happened to you yet, on the way down. I really like this analogy!!! Operating expenses of central Japanese railways from their income statement is 1170 billion yen for 1196 km of HSR. It operates some conventional lines too but it is negligible. So pretty much all of its operating expense is shinkansen related only as far as I can tell. For 500 km of Mumbai - Ahmd it comes to around 475 billion yen or around 25000 cr rupees/year. But the tokyo - osaka line carries 400k passengers per day while Mumbai - Ahmd line estimates are only 40k/day. So accordingly the operating expenses should be 2500 cr/year. Of course not all costs linearly scale up or down - there will be costs which will be same irrespective of the volume of traffic but I assume they will be offset by higher salaries and other expenses in Japan compared to India. On the balance, the Mumbai - Ahdbad line will be close to break even from the start and will be definitely profitable by the time the first payment comes through. Regarding costs, electricity costs scale up exponentially with operational speed, IIRC. It requires substantially more energy and thus costs a lot more to ramp up speed from 275km/h to 300km/h, compared to 225km/h to 250km/h. Your chart on Seoul-Busan line is very informative. Look at the ridership of conventional train! Almost wiped out. Suraj wrote: Regarding costs, electricity costs scale up exponentially with operational speed, IIRC. It requires substantially more energy and thus costs a lot more to ramp up speed from 275km/h to 300km/h, compared to 225km/h to 250km/h. But that would be the same in Japan and India, no? I think from my and disha's calculations it is looking like operational profit will be easy to attain. If you take principal and interest (this is negligible really, 100cr/year), initially it will be a loss but the 15 year moratorium and 50 year term will make it profitable soon. That will be 234 cr, not 2340 cr. Hanumadu'ji - yes., did a calc with 0.5% instead of 0.05%., so yes corrected my post. Let us take a stab at how much electricity cost will it actually be. At 4% inflation, the annual payment to service the loan by the end of the term will be 125 crore/year. A minor nitpick, energy consumed should increase as greater than speed^2 (Kinetic energy + some to account for efficiency), not exactly exponential. Yes, I'm not disagreeing with you in any manner. I'm just looking at a cost breakdown. Actually I don't have a good reference to what is a fractional breakdown of normal HSR operating costs. Any references on that topic would be welcome. Shinkansen has grades of service too, and they cost more for the fastest trains. For example, the Nozomi service on the Tokaido Shinkansen line has only two stops after Tokyo and Yokohama - at Nagoya (home of Toyota) and Kyoto - before Osaka. The Nagoya - Yokohama part is a continuous 1+hr high speed run at 275km/h, and that's the part where it goes past Mt Fuji in the iconic image. The slower Hikari and Kodama services have more stops and are cheaper. Suraj wrote: Shinkansen has grades of service too, and they cost more for the fastest trains. For example, the Nozomi service on the Tokaido Shinkansen line has only two stops after Tokyo and Yokohama - at Nagoya (home of Toyota) and Kyoto - before Osaka. The Nagoya - Yokohama part is a continuous 1+hr high speed run at 275km/h, and that's the part where it goes past Mt Fuji in the iconic image. The slower Hikari and Kodama services have more stops and are cheaper. Is that really the case? The Hikari/Kodama fare between Tokyo and Shin-Osaka is 14,100 JPY, the Nozomi fare is 15,310 JPY (14,480 JPY for a non-reserved seat). Not that big a difference. Moreover, there are comparatively fewer Hikari/Kodama services on this route. Taiwan High Speed Railway was built using the same Japanese technology, same rolling stock (slightly modified in appearance)- built in Japan and imported to Taiwan. THR spans a distance of 350 km from Taipei to Kaoshoung. The fare is $1450 (New Taiwan Dollar), roughly equal to 5500 JPY. This is LESS THAN HALF that of the cheapest Shinkansen fare between Tokyo and Osaka!!. The fare between Tokyo and Nagoya (which is roughly the same distance (366 km) as Tapiei to Kaoshung (345 km) is 10,880 JPY, nearly double the THR fare for same distance!! Taiwan is a pretty rich country with high standards (and cost) of living pretty comparable with Japan. It should be reasonable to assume that their operating costs are substantially higher than what are estimated for India. If they can run the trains at a lower cost, why can't we assume that the fares can be pegged lower still in India? Ha ha Suraj sir you embarass me! But seriously, I do believe that such cost-benefit analysis must have gone into the DPR prepared for this purpose. Moreover, we can also do without some of the advanced features that equip Shinkansen such as anti-snow mechanisms, since they'll be unnecessary for the Ahmedabad-Mumbai route (or anywhere in India for that matter). This should further drive the costs down. Of course, the builders must consider heavier rain and more dust into the equation. I have not come across any links on when the construction is estimated to begin at the earliest. Any ideas? I was going to ask about heavy rains. Japan probably does not have similar weather. But Taiwan does. So comparing notes from there would help. Other thing is earthquakes with Gujarat being in an active seismic zone. Japan definitely has a lot of experience there with civil structures. Bade wrote: I was going to ask about heavy rains. Japan probably does not have similar weather. But Taiwan does. So comparing notes from there would help. Also they have lots of local storms and typhoons. Regarding the earthquake, Shinkansen system has some of the best in-built mechanisms to cope with an earthquake, the system is highly robust when it comes to that. Kashi wrote: Taiwan High Speed Railway was built using the same Japanese technology, same rolling stock (slightly modified in appearance)- built in Japan and imported to Taiwan. THR spans a distance of 350 km from Taipei to Kaoshoung. The fare is $1450 (New Taiwan Dollar), roughly equal to 5500 JPY. 1450 TWD is 2961 INR. hanumadu wrote: 1450 TWD is 2961 INR. Yes and Taiwan on the whole is more expensive than India, so we should expect to see those fares come down accordingly. Kashi wrote: I have not come across any links on when the construction is estimated to begin at the earliest. Any ideas? Not really. I hope it's sooner rather than later. The most expensive part of the cost is likely to be the time value of money. The more we argue and dither, the costlier it will get. That's the problem with these things. Despite stellar funding terms, too much dithering over the topic will only make the high costs a self fulfilling prophecy through the cost imposed by delays. Start building early, get it done, then spent about 3-5 years getting the ticket price structures figured out. The loan terms themselves provide for a 15 year period for the entire construction and initial operational stabilization before repayment starts. Not much to say about the loan terms of bullet train. We come from country of scarcity so can not really blame the one forward looking project the govt has taken. I can personally vouch for the impact of Kolkata metro on the city transportation that was also done well ahead of the rest of the nation. However, the last section of eastern DFCC is still not tendered even, forget operational. without that last part, there is no connectivity with Kolkata or Haldia port on the eastern side and goods mostly will flow from east to west leaving the return leg under utilized. * Till date, most of the private MNCs invested in India have been given tax break and other inducements not only at the beginning but also periodically if the investment is significant with lot of jobs and their profitability projection has not been met. Both by central govt and state govt. Both govt have enough discretionary financial power to do so and that power is actually utilized quite often. Mitsubishi Chemicals, Ford motors - examples galore. Now, when that happens, the govt (& by definition, mango people) does lose out on revenue. So, while I am not against bullet train per se, the economic argument that the mango people will not be affected as central govt does not provide sovereign guarantee ala enron is not true. Per my understanding this is not going to be on IR books. It will be a separate entity. DFCC will be on IR books which is good because railways makes most of its money from freight. Desi cab dashboard mounted signals to be introduced post March 2016 between NDLS and JHS and NDLS and MGS. Some of you have been clamoring for it and rightly so. Delhi-Chennai HSR may go to the Chinese if terms are favorable but I am not sure if their tech is as advanced given the accidents. However, they may still get it given that they have the moolah required. I wish the Japs could build all of them. The French may not have the capital to do it. Does not matter if the entity is a separate JV or subsidiary of IR. The money will come out of Indian economy in one form or another i.e. Other than the 3rd form, the first two are not economically beneficial for large section of Indian tax payers directly. So, let's hope that the project achieves the profit calculations being projected here. Supratik wrote: Delhi-Chennai HSR may go to the Chinese if terms are favorable but I am not sure if their tech is as advanced given the accidents. However, they may still get it given that they have the moolah required. I wish the Japs could build all of them. The French may not have the capital to do it. Whoever builds any HSR, must be made to confirm one common standard so that we are not locked down by one vendor in any sector. Didn't see this news posted here. x-post from the Japan thread. Longest loan tenor, longest moratorium on repayment and lowest interest rate — these three terms define the finance extended by Japan to India for the Mumbai-Ahmedabad high speed rail in project, in context of Japan’s earlier loans to India in the rail-based sector. The Japanese loan component of $12 billion has been worked out on one of the most attractive repayment terms at almost zero per cent – 0.1 per cent to be precise -- after pretty strong negotiations for the financing, with a 15-year moratorium on a 50-year repayment period. The Delhi Metro and Chennai Metro projects had 30-year repayment tenor with interest rate of 1.2 and 1.4 per cent respectively, with 10-year moratorium period on repayment. Funds for freight corridor have been extended with 0.2 per cent interest rate and 40 years, with a year moratorium. “The deal requires supply of eight-ten Japanese technology items such as rolling stock (train set), signalling and telecommunication systems. But this works out to be about 20-22 per cent, much lower than the extent of tied-component of 30 per cent in case of dedicated freight corridor,” explained a top railway official in the know. According to an official statement, Japan has offered an assistance of over Rs79,000 crore. The loan is for a period of 50 years with 15 years moratorium with an interest rate of 0.1 per cent. The project is a 508 km line costing a total of Rs. 97,636 crore. Then the project is to be implemented in a period of seven years. It has been agreed that for the Mumbai – Ahmedabad HSR Project, Shinkansen Technology (Japanese high speed technology will be adopted. The cooperation of Japan on this project will also be fixed on transfer of technology and “Make in India”. 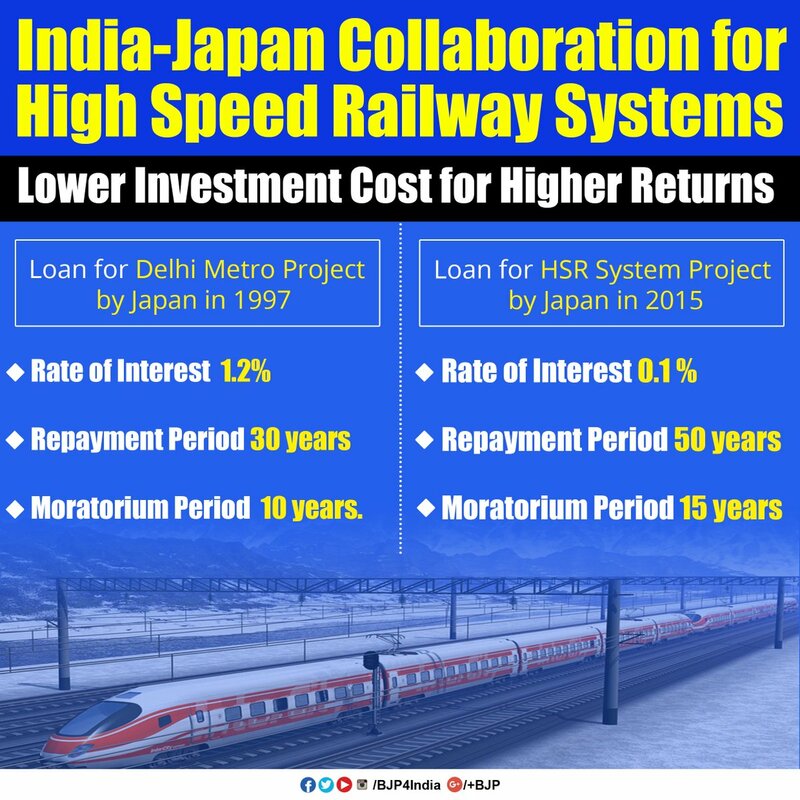 Japan will assist India in training of personnel for high speed rail (HSR). “The funding terms are very attractive. The long tenor will ensure that by the time the repayment starts, there is enough ridership between Ahmedabad and Mumbai,” Ajay Shankar, former DIPP secretary, who also heads a committee on public private partnership set up by the Indian Railways. The project structuring and administrative details will have to be worked out in the future. This was one of the fastest deals to be signed after JICA submitted the feasibility report in July. “The project’s advantages can be captured better in a separate special purpose vehicle,” said Shankar. The project structure has to be made such that the benefits of increase in real estate costs can be ploughed back into the project, said another official source. Along with the financing deal, there also other agreements related to the transfer of knowhow. For instance, Ministry of Railways and Japan’s Ministry of Land, Infrastructure and Transport on Technological Cooperation in Rail Sector have signed agreement that establishes areas for technological cooperation including sharing of information and best practices; exchanges of officials and technicians; facilitating the participation of other institutions, organisations and ministries and conducting joint research and studies. Another agreement is related to the memorandum of understanding on technological cooperation between Research Designs and Standards Organization (RDSO) and Japan Railway Technical Research Institute (JRTRI). The memorandum proposes to cooperate in the areas of safety in train operation; advanced techniques of maintenance; use of environment friendly technologies, said an official statement.